The first year of the IGFA Great Marlin Race (IGMR) has come to a close, with anglers in six events deploying 23 satellite tags in both blue and black marlin in three oceans. The marlin have swam a total of 11,484 nautical miles (nm) thus far, tracked from the tags on these majestic game fish. The winning tag accounted for 41 percent of that distance — that marlin was tagged by team Texas-Scot Connection, sponsored by Trevor Somny, Bruce McKee, and Bill Crawford during the Club Nautico de San Juan 58th Annual Billfish Tournament held in Puerto Rico in September, 2011. 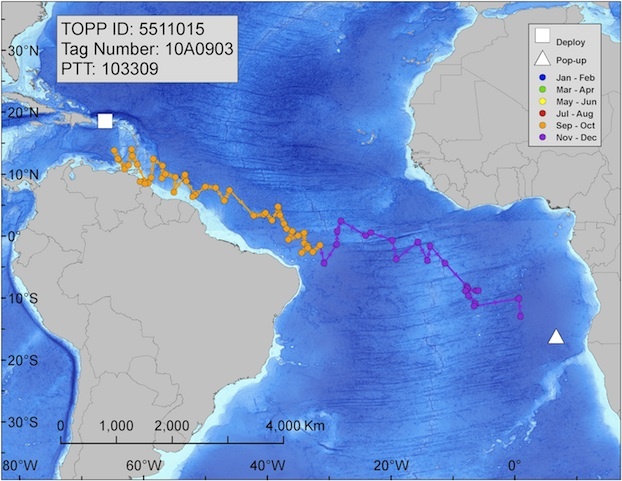 Traversing the Atlantic Ocean and covering 4,776 nm, this tag, placed in a 575-pound blue marlin, officially won the first year of the IGMR. It also represents the longest track ever recorded from an electronic tag in a marlin. Although the Texas-Scot Connection tag covered the lion’s share of the distance reported back from the satellite tags so far, the second and third place tags also made notable journeys. The second place tag, deployed and sponsored by Bjorn Farley in a 220-pound blue marlin during the 2012 GAMEX/Australian International Billfish Tournament on March 29th, traveled 1,035 nm and popped up 310 nm west of Java, Indonesia. Following close behind in third place was a tag sponsored by Wayne Ritchie and Ivan Hartley and Team W. This fish traveled 1,018 nm, rounding the Cape of Good Hope after it was deployed in a 330-pound blue marlin during the Fourth Colombia Billfish Classic, hosted by the South Africa Deep Sea Angling Association in February of 2012. In addition to expanding our knowledge about one of the ocean’s most coveted game fish, the data from the IGMR has also already made an impact in fisheries management. The winning tag and its journey across the Atlantic were referenced in the IGFA’s Congressional testimony in support of the Billfish Conservation Act, which was passed into law on October 5, 2012. Scientists and anglers alike are eagerly waiting for tags to begin reporting back from the IGMR tagging events that have taken place in Portugal, Spain, and Hawaii in the past few months. This year’s tags have been programmed to pop up after 180 days, so it is hoped the scientists will collect even more data. The winners of this year’s IGMR will receive complimentary lodging, and tickets to the 29th Annual IGFA International Auction & Banquet at IGFA headquarters in Dania Beach, Florida, on January 25, 2013 to celebrate their victory and toast the angler — Mike Benitez — who tagged the winning fish. Benitez passed away just two days before the tag popped up, but his team’s IGMR victory — and the data collected from it — remain a testament to his angling legacy in Puerto Rico.